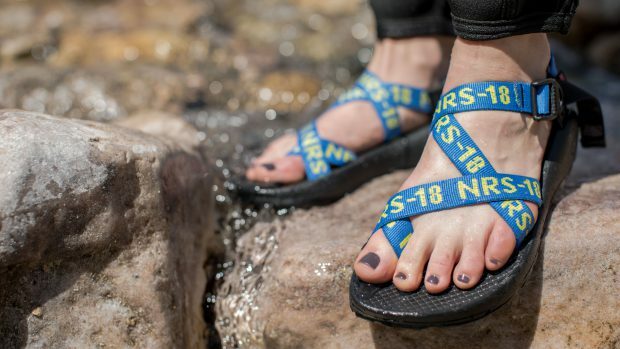 Chaco and Northwest River Supplies (NRS), two iconic whitewater brands, have created a limited-edition sandals collection in recognition of the 50th anniversary of the Wild and Scenic Rivers Act. The National Wild and Scenic Rivers System was created by Congress in 1968 to preserve rivers with outstanding natural, cultural and recreational value. The Act recognizes the importance of protecting the special character of these rivers, while also recognizing potential for their appropriate use and development. The collection is highlighted by made-in-the-USA, limited-edition Z/Sandals, featuring a unique webbing design inspired by NRS’ iconic blue and yellow tie-down straps—pieces of gear that are staples of river life everywhere. The repeating “NRS-18” print speaks to 2018 as the 50th anniversary of the legislation. The sandals are available in men’s and women’s styles at Chacos.com, NRS.com and REI. Chaco is also making a $10,000 donation to American Rivers and its 5,000 Miles of Wild campaign, assisting in the protection of rivers and riverside lands nationwide.